Caramel apples look good enough to sink your teeth into — but we’ve all learned the hard way that they’re not that easy to eat. If you’re already hankering for a fall (and especially for a Halloween-inspired) treat, we’ve solved the problem of gooey apple vs. tooth for you already. Adorable and delicious mini caramel apple bites are easy to nibble on, and we think they taste even better than the real thing. To get the party started, we tried crushed peanuts, assorted sprinkles and sweetened coconut flakes, but so many toppings come to mind! Crushed pretzels, crackers, mini M&M’S… and the list goes on! Adding kosher or sea salt to the melted caramel gives it that addictive salted caramel taste we love, but the salt is optional. You’ll have so much fun with these, we promise. Melt down the caramels, stirring often, in a double boiler or glass bowl placed over a pot of boiling water. Once the caramel is melted down and smooth, add the cream and salt, and stir to mix well. Turn down the heat to the lowest setting to keep the mixture warm. Since the caramel is not on a direct heat source, it should not burn. Assemble your small bowls (or ramekins), and fill each with its own topping — crushed peanuts, sprinkles, coconut flakes, etc. Place as many mini cupcake wrappers as you plan to use on a flat plate (these are going to go right into the fridge, so make sure there’s a space to fit the plate). Using the melon baller, scoop out mini apple balls from your apple. They won’t be perfect circles; they’ll be somewhat flat on one side. That’s fine, as these are bite-size treats! The size of your apples will determine how many mini apple bites you get. One apple equals about 12 – 16 bites. Now using your chopstick or skewer, pierce the rounded side of 1 apple bite, and carefully dip it into the warm caramel, rolling and using a silicone spatula to help in the shaping. Coat the entire apple bite with caramel, but try to not load it on too thick. Working fast, dip the flat end of the now-coated caramel bite into one of your bowls with the toppings. Coat the entire bite with the topping. 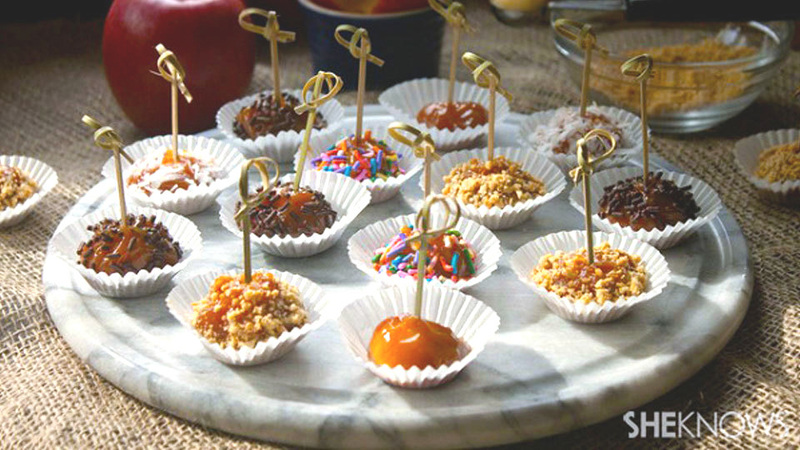 Place the coated caramel apple bite into one of the mini cupcake wrappers. Carefully remove the chopstick or skewer, and insert a festive toothpick. Continue this process until all the caramel apple bites are finished. Place the plate in the fridge, and allow the bites to set from 20 minutes to overnight. Serve. Tip: You may notice with some of your caramel apple bites that the caramel settles a bit at the bottom of the cupcake wrapper. What’s nice about using the wrappers is that you can easily push the pliable caramel back up over the apple bite by gently squeezing the wrapper upward. Originally published October 2013. Updated September 2016.